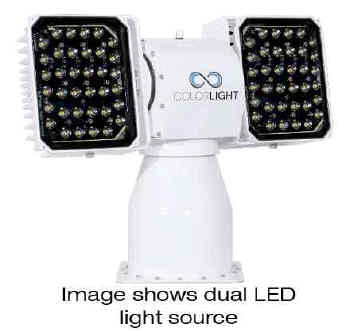 The CLED35-13 model features a combination 575W high CRI/High CCT (6000K) "daylight" light and a 240W HO (high output) energy saving LED array. Each lamp head can be operated independently, including beam focus adjustment (HMI side only), or synchronized together for maximum output. The solid state HO LED light source adds a level of security and reliability most appreciated for such a crucial piece of safety equipment. LED's advantage is power savings, long life (no maintenance), durability (shock resistant) and the ability to turn on instantly, even in freezing conditions. The CLED35-13 is constructed of robust acid-proof stainless steel. The internal components are digitally controlled and monitored and the brushless digital controlled motors equate to no planned maintenance the first 10 years of operation! This model comes complete with a compact 100-240V electronic box, OP3G bridge panel remote control, 3m (10') power & bus/signal cable, and 5m (16.5') control cable.